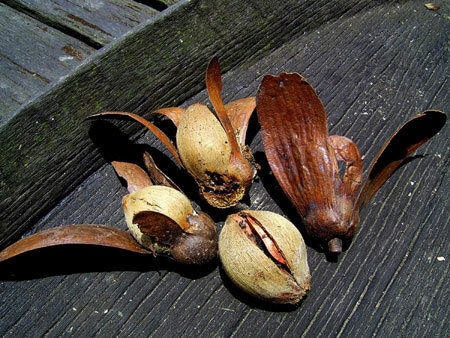 JUNGLE LESSONS: The illipe nut is among the products of the disappearing trees. I DON’T know if there’s anything at all that readers can usefully learn from this column today. Well, they have a choice. If they want something more interesting, certainly more educational, they are recommended to read the Auditor General’s Report 2012. For good measure, they might as well get a copy of his report for 2011. Several of my readers have been ‘pestering’ me to put down in writing all that l can remember of what the boys of my age did during the Japanese Occupation. They wish to know if there is any difference between what the boys were up to, 60 years ago and now; what games they played, and what life was generally like for them. Let me say at once that boys are boys, 60 or six years ago. Human nature has not changed much since the appearance of Homo sapiens on this Earth. For this piece, however, I’m fast backtracking to the Second World War. When the Japanese army landed in Kuching on Christmas Eve in 1941, I was away in Lundu. It took several months before the Japanese came to the district. During the war, most of the villagers at Stunggang had moved up the river of the same name to be safe from the Japanese soldiers. It was rumoured that they would take away the young women of the village and confiscate our rice and chickens. The villagers had cleared the jungle at Ulu Stunggang Nonya and Bedaun, burnt it and then planted rice, millet, corn, tapioca, cucumber and pineapples. My family had moved to our old farm at Sebutus where my father had planted rubber before the war and during the war years he cleared more tracts of the surrounding forests. There we built a langkau (temporary farm house). At night we burnt dry twigs to scare away the mosquitoes, virtually smoking ourselves out in the process. I hate mosquitoes, still do today. Murder one every time you see it, for my sake. I was supposed to help Dad in felling the trees but I was there more for his company than of any practical use to him in his task at hand. Most of the time I was dreaming: playing with friends miles away. Sometimes we went hunting for wild boar, but seldom caught any. In the jungle Dad taught me how to recognise and mark out the useful trees that must not be felled, especially those which produced edible or useful fruits – the Pekang (similar to the Tampoi), Telu Kejiha’, the Tanjan, Kandis, Kubal, Mujau, Sibau, Sebutus, Tanggui China, or Engkabang, and many others. Those must be preserved, declared Dad. He also informed me that certain creepers (akah) – which contained water – too must not be cut down because they were a source of drinking water in the jungle. Not all of a rattan clump should be destroyed; take only the mature cane and leave some for the other villagers who might also need them for their own use. Streams must not be poisoned for fish because all the fish “including all their anak (children) would die with their parents”. Dad was very strict in matters relating to any plant or mushrooms as sources of food or medicine. While he was lecturing on the finer points of jungle craft, most of them fell on deaf ears (mine); my mind was wondering elsewhere: food. One day while Dad and I were stalking a wild boar, while noticing a tree full of ripe fruit (Pekang) on it, I started felling it and the noise scared away the animal. I had a good dose of reprimand from Dad, telling me to climb the tree and pick the fruit instead, never fell the mother tree. That was how I learnt to climb a tree, at first with extreme difficulty, later it was a cup of tea. During the first year of the Occupation, we were short of rice, the stock from the previous year’s harvest having almost run out. We could not buy any new clothes because there were none in town which normally got its supplies from Kuching and Kuching was cut totally off from us. Supplies of salted fish, mainly anchovies, became scarcer by the day because the local Malay fishermen had not gone to the sea. Sugar and salt were not easily available and even if available they were too expensive for us. Somehow we managed to get some from the China Lampu, the grocery boat (sampan) owned and operated by a family friend, Ah Ngim. From him we obtained our supplies specially reserved for us. When the war was over in 1945, we moved back to the village and every family repaired their houses. Life started all over again. For me, it was an entirely new life. The Mission school had reopened soon after the war and I went to school there for the first time, learning the ABCs and the sums (arithmetic). The teacher was Miss Margaret Hugh or Achi’, daughter of the priest, Hope Hugh. Other than church going and joining the carolling at Christmas time, there was not much else with which the boys in the village could occupy their time. The boys were – Joshua Angie, Mahari and his brother Helly, Morris Mancha and his brother Pading, Ili and his brother Tuhi, Bita Saba and his brother Achin. They would go fishing and hunting. There were several ways of catching fish and prawns as there were a couple of methods of catching animals. Nuba, Najur, Nani’ Bubu, Ngehawai, Meluntang, Mansai, Nehegis – these are methods of catching fish and prawns. Normally, for a big scale ‘fish catching’ the villagers used the Tuba roots (Derris spp) but we boys were only allowed to use the seeds of the tree called Guhah which are not as poisonous as the Tuba. As a result, most of the time we caught no fish of a size to be proud of. We fell back on Najur for the catfish (keli) or the Bubu (trap made of bamboo or tree bark with a narrow opening and sharp spikes inside so that fish can go in but cannot get out because of the spikes). Similar to the Maori hinaki. We trapped squirrels for meat; we caught the Lorikeet birds (Telit) for sale to the Chinese boys in town. Liming birds is an interesting method – the bird is caught live on a stick properly limed with a strong latex of the tree called pedalai (Artocarpus). We used stek (catapults) for other birds. Once in a while, we would join a group of experienced hunters in an operation called Ngelambat for deer or kijang. We set traps (pangkup or panjuk) with a bait of the inflorescence of a tree called Buan for the mouse deer. Another method of catching prawns, the small variety, called Sepunuk or Sene’ as the local Malays call them is by Tehegis. It was done at night when the tide was at its lowest. A coconut frond was tied to a boat as the paddler dragged the frond barely above the water level. Little prawns would jump over and onto the boat. Do this for a couple of hours until the tide turns. I’m told that this method has not been used on the Kayan River for many years now because there are many crocodiles in that river. They may not welcome another competitor for prawns. To earn some money we tapped rubber trees or sold bundong (water reeds) used as string by the shopkeepers. We sold the leaves of the Buan used for wrapping things before the coming of the old newspapers and the plastic bags. Ten cents of the Straits Currency bought a kati of anchovies; a dollar would see a family of four through the week. It was not all work and no play for the boys in the village, though. We invented a sport called Main Telung – an empty milk tin was mounted on a stick planted about two feet high. The thrower must be able to dislodge the milk tin put up by his competitor, from a distance of 20 feet. If he missed the target, he lost his turn. Anybody who could keep on dislodging the tin consistently for a few times would be the winner. The prize was the satisfaction of bullying the competitor who kept on putting back the tin; the whole idea was to embarrass him as long as possible until he cried and gave up. Of course, we flew the kites (wau or gudi). We competed – the boy whose kite with string heavily laced with pounded glass and which cut off the string of the other kite in a dog fight would be the winner. Sometimes, the game ended up with real fist fights on the ground between the players. There was another game which we devised but which did not last long because the village elders disapproved of it as being silly. Two or three boys would climb a short tree and one boy would fell it. Imagine the thrill of falling onto the bush or water. One day we tried with a bigger taller tree (pedada) by the river. One of the participants was hemmed in by the branches and almost drowned. That was the end of the game. We had done something daft. Boys are boys, you know. But we had learnt a good lesson. The jungle has a lot to teach us.